The designers have much to do with their routine tasks, it is not about just completing it but it is more about being creative and inventive enough with every project so the clients don’t come up with complaints or arguments about that. Right here we provide and put forward the work of experts so to help the beginners and learners. New directions and vistas are explored every single day you see, because designers never go on a holiday. They hardly enjoy respites and vacation rather they like to spend their leisure time into exploration, inspiration and probing into the future tasks. This is the ladder towards success, when you think more about work and plan stuff in your mind. One should always get oneself involved into projects so to give the best one can and have a far fetched results in the end. It is also about adding good stuff into one’s portfolio so whenever you apply for a position and post, you are welcomed with open arms. It depends on the experience and the practice of a designer that how good of a grip he has onto his technique and style of designing. The perfection and finesse comes naturally, it is never a forced process. However learning should always be one’s priority, it is pivotal and it should be considered the first preliminary to be a professional later on. Over time and one’s investment the skill gets improved. “Try, try again, no pain, no gain” rightly applies over here. The more pain you are ready to take, the more fruits you will be reaping in the end. 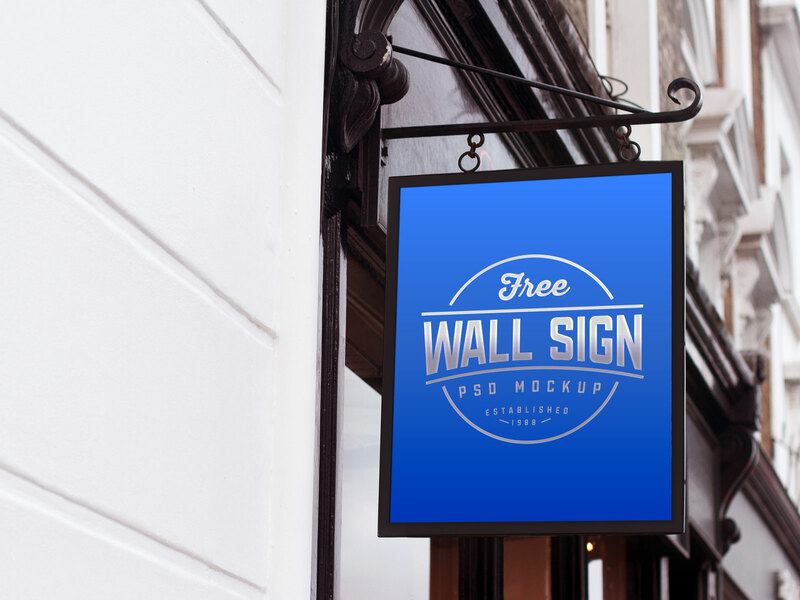 Coming towards our today’s post which is highlighting free beautiful wall mounted sign board mockup for street shops. If you are up to designing a shop sign board and are looking up for the outdoor mockup for presentation before your client, then this will help you out. Shop sign boards help the visitors to locate the store easily and also people can stand and stare to notice what the shop offers inside of it just by looking at the sign board. Use this mockup for commercial/personal projects. What do you guys think about it? Let us know so we will feel all bucked up for the future endeavors with you. Right here we are to give you all the design benefits as much as we can. Give us your feedback guys.